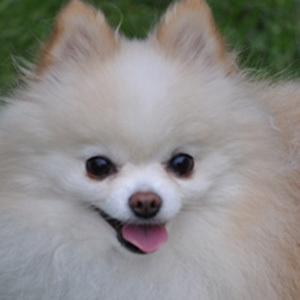 Kirby is a small Pomeranian at just over 4 pounds and was rescued from a puppy mill at age 2. Susanne says he has learned a lot about being a dog since leaving the puppy mill and loves getting to go places with her. Kirby is very sweet and loves attention from everyone he meets. Susanne has 2 other rescues (Taz and Rocky) who are registered North Star Therapy Animals as well. As a therapy dog, Kirby followed in the footsteps of his big brother, Bruce, who brought joy for years before he went to the Rainbow Bridge in 2014. Bruce was Susanne’s first puppy mill rescue that went on to work as a therapy dog. Kirby continued that legacy by visiting with Susanne and bringing lots of smiles at the Ronald McDonald House. Kirby’s favorite off duty hobby is sitting next to Susanne, but he also makes plenty of time for exploring their fenced yard.